InsideTracker’s Fitness and Performance Plans measure two iron-related markers, hemoglobin and ferritin. Our new Ultimate Plan adds four more iron-related markers to give users a systemic view of this essential nutrient, allowing for a better understanding of any iron imbalances. How does the body acquire and expel iron? The body cannot make iron; you must acquire it through your diet. Dietary iron is processed and absorbed by the mucosal cells of the small intestine. Only about 10% of the iron we consume each day is absorbed into the body, however. The process of iron absorption is tightly regulated because the body does not posses any biochemical mechanisms for removing iron. Instead, iron is lost through processes such as bleeding, menstruation, and breast-feeding. Additionally, iron within the body is constantly being recycled and reused (e.g., in red blood cell turnover). What happens once iron enters the body? After being absorbed into the mucosal cells of the small intestine, a portion of the iron is stored in the protein ferritin. Each ferritin molecule is capable of binding to around 4,500 iron molecules at a time. Ferritin binds and releases iron in response to fluctuating amounts of iron in the blood, thereby maintaining a relatively constant serum (blood) iron level. Ferritin is found in all cells, but is most common in bone marrow, the liver, and the spleen. The liver, heart, and pancreas typically have high levels of ferritin and are therefore susceptible to disease or damage from iron overload. Iron not stored within ferritin is exported from the intestinal cells and released into the bloodstream. Once the iron enters the blood, it is bound by the protein transferrin. Proteins like transferrin prevent iron from forming cell-damaging compounds such as free radicals and aid in the transportation of iron to various tissues throughout the body. Some iron is also shuttled to the bone marrow where it plays a key role in the formation of new red blood cells. 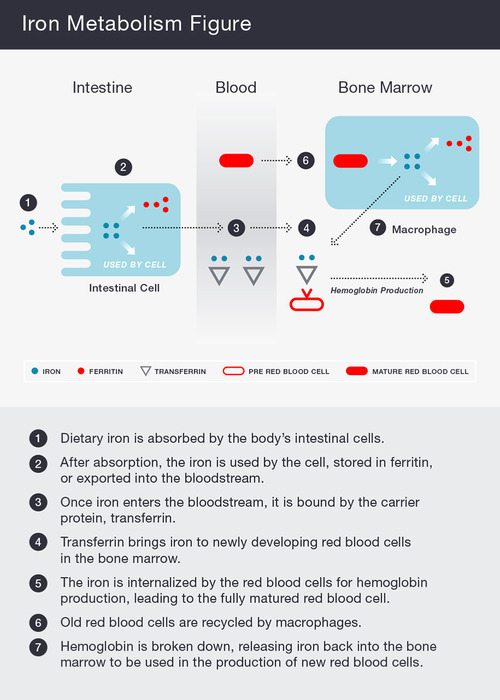 Iron-bound transferrin binds to the transferrin receptor on the surface of newly forming red blood cells, then moves into the cell where the iron is separated from the transferrin. The transferrin protein returns to the bloodstream, and the iron is available in the cell for use. Since red blood cells have such a short lifespan (about 120 days), the body requires a constant supply of iron to rebuild hemoglobin. As a result, dying red blood cells are recycled by white blood cells known as macrophages. Old hemoglobin is broken down to replenish the blood’s iron supply. Why might my iron be low? One reason you may be low on iron is that your body’s demand for iron may have increased. This often occurs in young children undergoing rapid growth, pregnant women, and people who lose blood through blood donation, intestinal conditions, menstruation, or very intense endurance activity. Another reason for low iron is decreased iron intake or absorption. The Institute of Medicine of the National Academy of Sciences recommends that men aged 19-50 consume 8 mg of iron per day and premenopausal women consume 18 mg of iron per day. After menopause, women’s iron needs drop to the same level as men’s: 8 mg per day. How can I improve my body’s iron status? Dietary iron takes two forms: heme (meat, poultry, and fish) and nonheme (beans, spinach, and fortified foods). Although nonheme iron is the more abundant form, the body more readily absorbs heme iron. Therefore you can increase iron absorption by consuming more heme iron. In addition, vitamin C helps to increase the amount of iron that your body absorbs; consuming foods or beverages rich in vitamin C at the same time that you are eating foods high in iron will boost iron absorption. Other compounds inhibit the absorption of iron, so you should avoid consuming foods or beverages containing these substances at the same time you are eating iron-rich foods. For example, for improved iron absorption, don’t drink coffee or tea during a meal or for one hour following a meal. Similarly, legumes and whole grains contain compounds that reduce iron absorption - so avoid consuming beans or whole grains with an iron-rich meal. The InsideTracker Fitness and Performance Plans measure ferritin and hemoglobin, two essential iron markers. Ferritin is the protein that binds iron for storage. Ferritin’s main function is to keep the levels of active iron in the body relatively constant by releasing or binding iron. If the body is low on iron, it can access iron stored in ferritin. If the body is high on iron, it can store potentially damaging excess iron within Ferritin. If your Ferritin is low, you should pay close attention to your iron levels. Hemoglobin is the iron-containing oxygen-transporter in red blood cells. Its primary function is to carry oxygen from the lungs to the muscles, brain, and digestive system where it releases the oxygen for cell use. Optimal levels of hemoglobin improve strength, increase endurance, and enhance overall aerobic performance. The four new iron-related markers included in the Ultimate panel give a detailed picture of iron in your body: Serum Iron - the amount of iron in the blood Total Iron Binding Capacity (TIBC) - measures the maximum amount of iron your blood can carry, and is an indirect measure of transferrin, which transports iron to various tissues and prevents iron from causing damage in the body. Unsaturated Iron Binding Capacity (UIBC) - is TIBC minus serum iron Transferrin Saturation (also called Iron Saturation) – is Serum Iron divided by TIBC and then multiplied by 100. It shows how much iron in the blood is bound by transferrin. Why should you know more about your iron levels? InsideTracker added these four iron markers to the Ultimate panel because Ferritin and Hemoglobin alone cannot give you a comprehensive understanding of your iron status. Serum iron, transferrin saturation, TIBC, and UIBC all reveal information about iron in your blood. Changes in these markers can show early signs of iron deficiency or excess even when your Ferritin is optimal. With six iron-related markers, the Ultimate Plan gives you a deep dive into your iron status that can help you to optimize your iron levels and thus increase your energy and focus, improve your aerobic performance, and strengthen your immune system. To find out more about your iron status, sign up for the Ultimate Plan today.